If you or a loved one have had surgery, be it a major surgery or a minor outpatient procedure, you know that how you heal is critical. There are 3 major types of healing that need to occur. Fascial healing When ever your skin is cut open, there will be damage to your fascia. Fascia is the skin on the inside of your body. It is where you get adhesions and where scar tissue can build up. If you have tightness near an incision site or if you noticed your posture has changed since surgery, you likely have fascial tension. Chiropractic First has helped a lot of people feel looser and like they have less tension after surgery. Other ways to address fascial tension is through myofascial massage or bodywork like Rolfing. Clearing anesthesia and other medications Anesthesia has a very specific metallic tone to it. Weeks, and sometimes even months after surgery, that metallic tone can remain in your body. When people come in for chiropractic care shortly after surgery, one of the first things we work on is helping your body clear out the large influx of pain medications and other pharmaceuticals you were exposed to during surgery. I have seen people make themselves very sick from doing liver detoxes or other programs that attempt to flush toxins out of their body too quickly and without proper support. If you have had surgery, your body likely needs help flushing out the chemicals you were given. Chiropractic First can help your body do that. Other natural health practitioners can help as well but be very careful when taking supplements or doing detox programs. Anything powerful can have significant consequences! Decreasing the freeze response and state of high alert Your brain knew you were having surgery and you knew that they were cutting into your body. You did it because you decided it was the right choice. Your body however, simply knows it was cut and deeply wounded. All your body knows is the trauma it has experienced. That may result in a variety of different responses. Your body may have “frozen” in response. You may feel locked up physically and unable to move forward emotionally. Your body may have gone into a hyper-vigilant state. In response to stress, we often become exceedingly aware of our environment. This can result in anxiety or increased pain. This is a totally normal response to physical trauma. 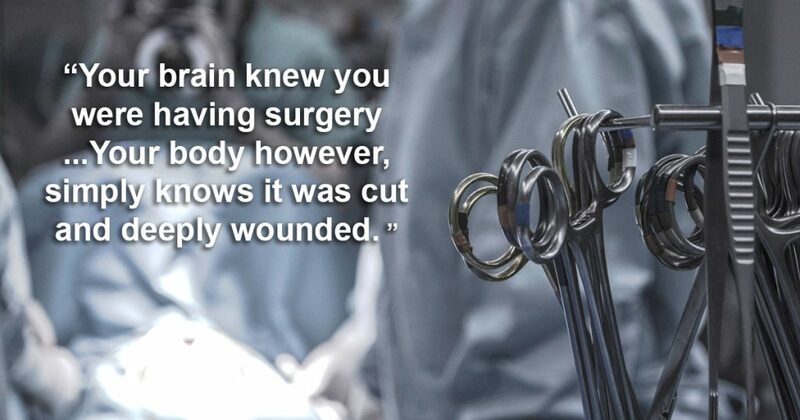 And while you know that being cut open in surgery is different than being cut open in a knife fight, your body doesn’t. You need to neurologically reset your fight or flight response. You need to change the way your body is reacting to the physical trauma you experienced. Chiropractic is a great way to do that. Other ways include yoga, meditation and targeted breath work. The sooner you start healing after surgery the faster your recovery will be. Please get adjusted within a few days of surgery! If you cannot lay down, that is no problem. We can adjust you seated or propped up on your back. We can work around tender sites, bandages or casts. The important thing is that we start helping you very soon after surgery. If you had surgery years ago, and feel like you never healed, let us know! There are still plenty of things we can do to help.